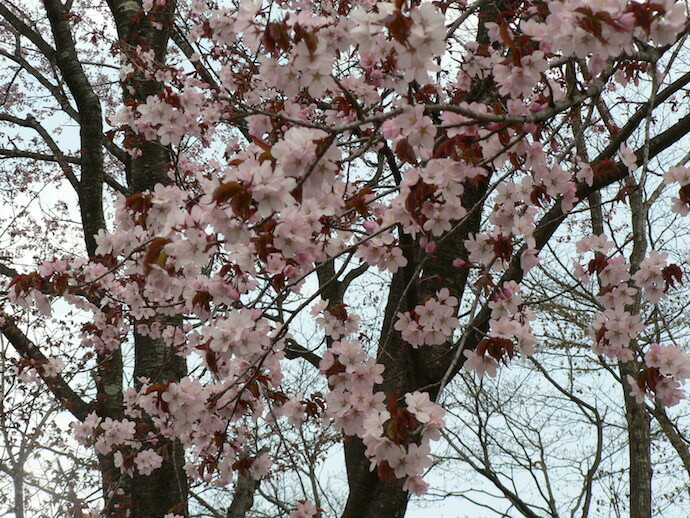 Ever since I moved into my own house here in Kurohime, Nagano, I have planted hundreds of cherry trees. Most of them have been Yamazakura, planted in what is now our Afan Woodland Trust, and many of them have now grown to be ten metres or so in height, with thick, dark trunks. 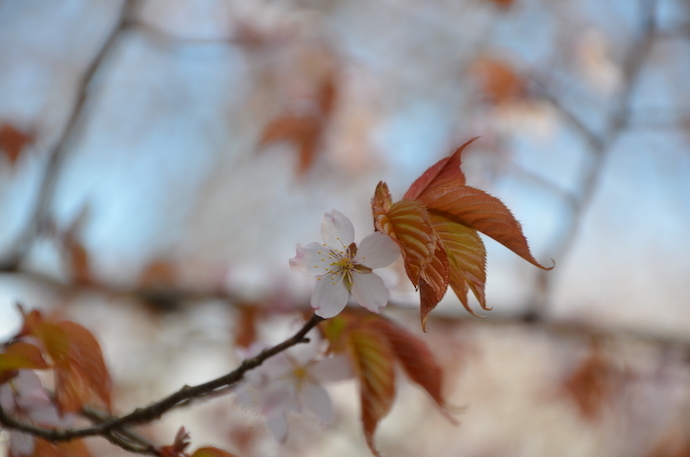 Although there are supposedly well over two hundred cultivars of cherry trees in Japan, all of them beautiful, I have always preferred the wild mountain cherry, ‘yamazakura’. Yamazakura leaves, so delicate and green, develop at the same time as the simple blossoms, which make the tree seem more delicate and less intense than the cherry blossoms of the cities, and nobody makes a great fuss when the petals fall, no heroic poems of fallen samurai, or young life cut short in its prime. 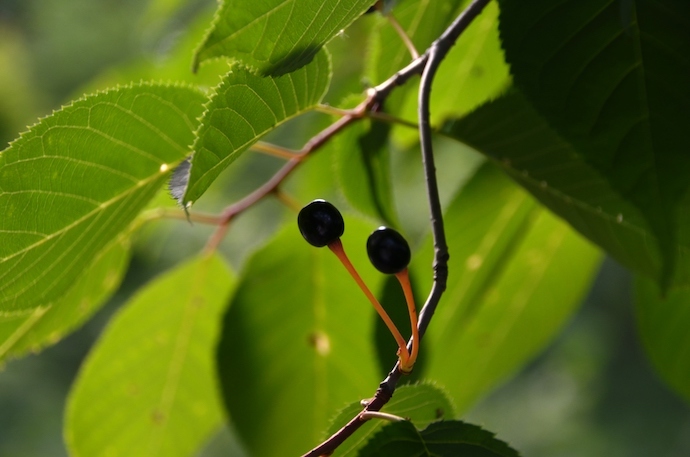 I have heard people, (especially some foreigners who have lived in Japan for a few years and therefore presume to know everything), that wild mountain cherries do not have fruits. That is nonsense. Yamazakura have small, black drupes (fleshy fruit with a hard inner ‘pip’ or seed) that are bittersweet to the taste and greatly loved by birds and bears … and indeed, by Old Nic. I like to put yamazakura cherries in a big jar, with a handful of Okinawan black sugar, topped up with 35% alcohol awamori; leave for a year and you have a fantastic cordial that is supposed to cure gout, and is a marvelous summer cocktail with iced soda water. Wild cherry wood is hard, reddish brown in colour, and greatly valued (especially in Europe and America) for making veneers, and the wood is also used for furniture, cabinets, and musical instruments. It is a fine wood for woodturning, making bowls and so forth. Wild cherry wood is also greatly valued for smoking fish, sausages, and ham, even cheese. In the past it was also widely used for making charcoal. Perhaps unique to Japan is the artistic craft of ‘kaba zaiku’, which is misnamed as far as I am concerned because the material comes from wild cherry bark, not birch. 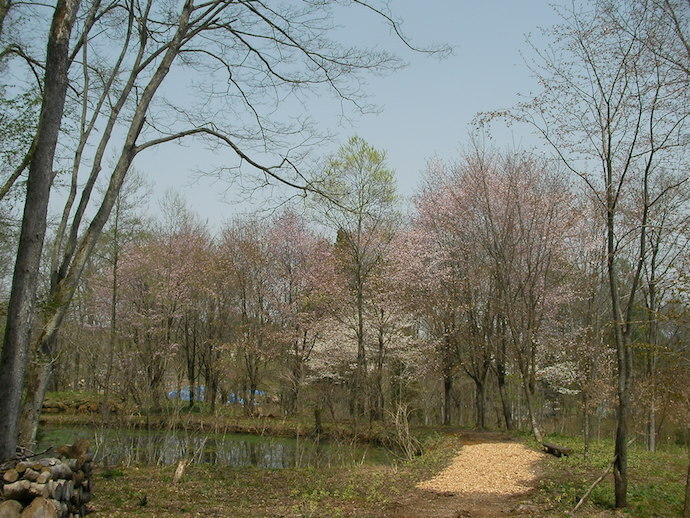 Wild cherry bark is airtight, and has long been used, often molded onto other woods such as cedar (sugi) to make light, strong, beautiful containers for tea, medicines and such. Kaba zaiku, with its beautiful patterns and deep colours, is also favoured for fine sheaths for swords and natta. My dear old friend and mentor, the famous architect Ikeda Takekuni, when sailing aboard the cruiser Yahagi, which accompanied battleship Yamato on her suicide mission to Okinawa, told me that he and many other Imperial Navy sailors and officers looked back at the green hills of Kyushu. For all too many this was the last sight they had of their native land, those deep green slopes, gently dabbed with the delicate colours of blossoming, life-affirming yamazakura. To this day, Ikeda-sensei has a special place in his heart for wild, free yamazakura, and so do I.